Explore the captivating history of the Incas! One of the most notable ancient cultures of South America is undoubtedly the Inca civilization. They once ruled over the largest empire in South America. Not only that - their empire was also the largest in the world at the time. There are many mysteries surrounding the Incas. Where did the Incas originate? And how did they come to rule over their vast empire that incorporated mountaintops, tropical jungles, and coastal lands? What were the most notable achievements of their great kings? What did their temples and monuments look like, especially the capital city of Cuzco and their breathtaking mountaintop settlement at Machu Picchu in modern-day Peru? The rise of the Inca empire: a cosmological event? And a great deal more that you don't want to miss out on! 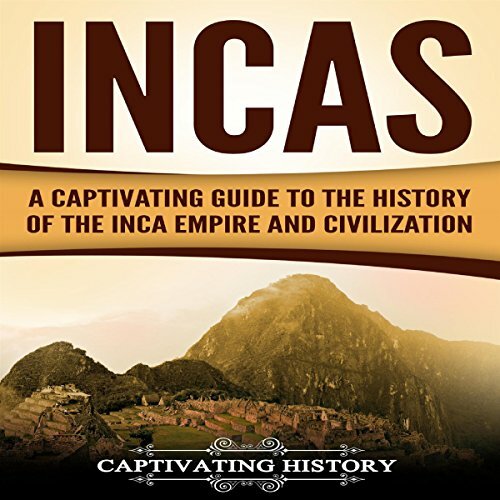 Get the audiobook now and learn more about the Incas. Great historical information, I plan on listening to the other books by this author soon. I enjoyed the concise presentation, the use of points of view for either side of a conflict, and the way the information was organized. The presenter is easy to understand. Got all, what I need about incas civilization. As a general history, this is really excellent work. The politics, economy and society of the Inca are intertwined with the personal histories. A must read to learn a better history. I formerly did not know much about the civilization of Inca. Other books show the Inca as a unified history, this book dismisses that notion with a clearer picture of how they indeed were prearranged. This is highly recommended for every ancient lover. It was really an inordinate read about an interesting civilization of the world. I desired to study more about it and I reached to this audible. At the end I felt like I was really missing the characters, because they had become so alive in the book. I have a new understanding and appreciation for the Inca, and would love to discover more. It is a well researched fictional history of the fall of the Incan empire. Great characters and incredible attention to historical detail. Leaves you wanting more! An amazing book, impossible to put it down. Obviously well researched, and given in such detail that seems to come to life as recent History. More than interesting about the Incas. Captivating History Series, it is a great series with lots of fresh information in this area... This was maybe my favorite one thus far. An extraordinary people were the Incas. Just so sad that most of what we know about the Incas was written in other language. This was due to the Inca never developing a system of writing.